The Riser is an all-new instrument for designing musical transitions of epic proportions. 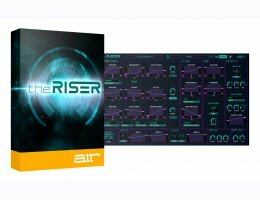 A powerful, synth-based instrument, The Riser features all of the tools you need to compose heart-stopping transitions in one intuitive user-interface. In seconds, you can construct rises, falls, swells, fades, and more, based on our coveted sound synthesis technology. For instant inspiration, The Riser includes 300 pro-grade presets that you can edit, deconstruct, copy, mangle, and implement into your tracks.